Consider using our cheap Eurostar finder, which is run in conjunction with Europe's leading international rail ticket specialist. 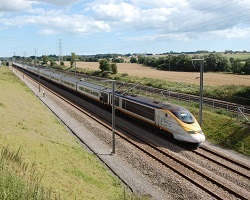 As such they access great deals on Eurostar and feature promotional rates as soon as they are available. The company celebrated the 20th anniversary of Eurostar being launched, the introduction of a brand new fleet during 2015 and the launch of a year round service to Geneva via Lille. This was joined by a service which stops at Lyon, Avignon and Marseille in 2015. Eurostar can get you from London to Paris in just 2 hours 15 minutes and, taking into account fast security and shorter transfer times into the city centres, it is the quickest way to and from the UK capital and its French and Belgium counterparts. As well as speed of travel, you can travel with more luggage. Every Eurostar ticket entitles the holder to 2 suitcases (maximum length 85cm) and one piece of hand luggage all with no weight limit. A far cry from hand luggage only prices on an airline. If you are taking one of the designated ski trains to the Alps then you can take an extra item of luggage per passenger, such as a pair of skis or a snowboard. That’s on top of the usual maximum of 2 medium-sized cases (85cm at their longest length), plus one item of hand luggage. Pushchairs and prams can also be taken alongside your luggage at no extra fee. On board, to make life easy, there is a special area in each carriage for large luggage. Then you can add the better legroom, lower costs in terms of transfers to and from the station or airport, frequency of services and better punctuality and it's easy to see why more people take the Eurostar to Paris or Brussels than fly. Book your Eurostar tickets today.